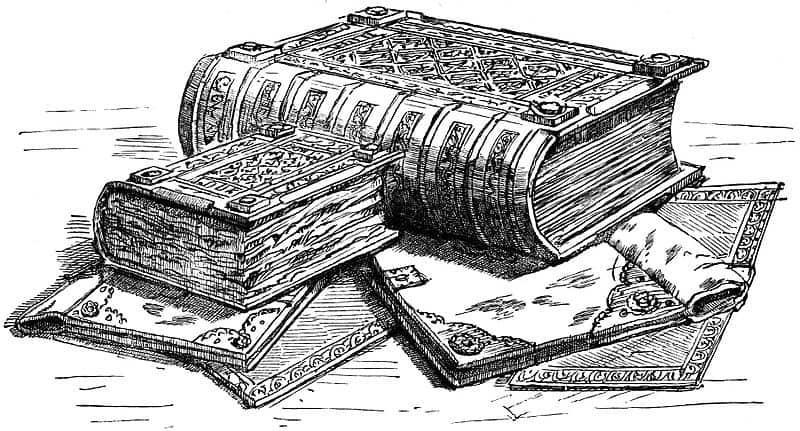 The word for a book-lover is a ‘bibliophile’, a word first recorded in print in 1824. Alternatively, there is the word ‘bookworm’, which is of an altogether more ancient pedigree: it first appears in 1580. But what words should every good bibliophile and bookworm know? Here are some of our favourites. If you enjoy these, we’ve also delved into the interesting world of words and language here. If you consider yourself an educated or ‘lettered’ person, you might be described as a LITERARIAN, a word coined from the French in the eighteenth century and probably modelled on similar words such as ‘librarian’ and ‘antiquarian’. Some people consider themselves highly educated and lettered literarians, but in fact they are often ULTRACREPIDARIAN – a handy word which refers to someone who gives an opinion on things s/he knows nothing about. This rather useful word is first recorded in a letter of 1819 written by influential critic William Hazlitt (indeed, he applies the word ‘ultracrepidarian’ to critics here in its inaugural use). Another word for this sort of person, whom you may overhear mouthing off about books, films, politics, or, indeed, anything at the next table in the pub or the coffee-house, is MOROSOPH. A ‘morosoph’ is a would-be philosopher – a fool who thinks he’s clever than he is. The word comes from the French writer Rabelais. If you’re not only an avid reader, but one of those people who simply cannot leave the house without a tome stashed in your pocket or bag, then it may interest you to know that Scottish novelist and poet Sir Walter Scott coined the phrase BOOK-BOSOMED to describe someone who carries a book at all times. The phrase first appears in Scott’s celebrated 1805 poem The Lay of the Last Minstrel. If it’s poetry you like, then why not read an AMPHIGOURI – another word for a piece of nonsense-verse. The origin of this term is unknown, but it’s altogether less famous than the equally mysteriously named limerick, those five-line comic poems which were named after Limerick in Ireland, but nobody quite knows why. Another popular form of comic verse which you may enjoy is the CLERIHEW, named after the middle name of E. C. Bentley (or Edmund Clerihew Bentley in full), which is a short comic or nonsensical poem which aims to sum up the life of someone – usually a famous figure – in just a few lines. Popular examples include the ones by Bentley himself beginning ‘George the Third / Ought never to have occurred’ and ‘Sir Humphrey Davy / Detested gravy.’ W. H. Auden was perhaps Bentley’s best heir, and penned a series of clerihews under the title ‘Academic Graffiti’, which you can read here. If you’re reading plays rather than poetry, look out for the DEUTERAGONIST – the second actor or person in a drama, after the protagonist. It’s first recorded in 1855 in a book by G. H. Lewes, the common-law husband of George Eliot. If you’ve read this far, the chances are you’re a voracious reader, someone who might be described as a BIBLIOPHAGIST – literally, a devourer of books. We’ll leave you with our own suggestion, BIBLIOSMIA – meaning the act of smelling books, especially as a way of getting a ‘fix’ from the aroma of old tomes. If you like unusual words, check out our pick of the eight best trivia books about the English language. More fun wordy stuff can be found in our tipsy list of words for drunkenness and our catalogue of unusual phobias. Image: The Domesday Book from William Andrews, Historic Byways and Highways of Old England (1900), public domain. Reblogged this on Smarterr Yet Stupiderr.